You can get a job that pays up to $1000 per week handing out free government cell phones. That’s right, helping people in need, and making great money. Cash in on the booming Lifeline cell phone business! Tens of millions of free cell phones have been given out to Americans in the last six years. Companies like Safelink Wireless, Budget Mobile, Assurance Wireless and dozens of others are profiting from the program, and so are the many thousands of people, just like you, in communities across the country who are signing up those who can’t afford their own phone and service. Yes, you too can be a high-earning free government phone program sales representative. Both part-time and full-time jobs are now being advertised in city after city in virtually all states. Most positions simply involve enrolling people into the Lifeline program by working at sidewalk tents outside government assistance offices, shelters, churches, flea markets, community centers and other high traffic areas in and around your neighborhood. Often no experience at all is required. We can’t promise how much you will make, but the ads we’ve seen often say that you can make upwards of $500 to $1,000 per week, based on commissions of between $5 to $10 per customer you enroll. Considering that customer enrollment takes just minutes, those five and ten dollar bills can add up in no time. And how difficult of a sale is it to sign up someone for a program that gives them something for nothing, with no contract? This sounds to us like the easiest sales job ever. Some Lifeline phone companies will directly hire members of their “street team.” For example, you can take a look at the job opportunities page for the Budget Wireless Street Fleet team, as they call it, by clicking here. You’ll see that they are hiring representatives to work in Sales, Canvassing, Street Teams, Promotions or Community Outreach. But other companies work through top-level distributors and agents, who advertise their job openings through online ads, most popularly on craigslist.org. 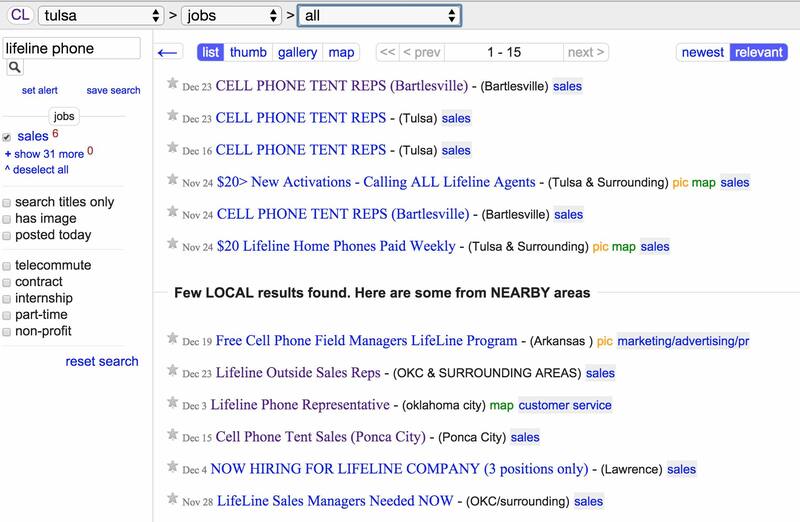 Searching your local Craigslist ads is the best place to find Lifeline phone sales opportunities, both working directly with a company or through an agent. You won’t find positions advertised in every city, but chances are if you are in a large urban area with a heavy low-income population, you will find a company or agent how could have a job for you. It only takes all of just a few minutes to check Craigslist, so there’s no reason to not give it a try. Here are step-by-step instructions to see if anyone in your area has posted an ad for a Lifeline phone sales representative. Step 1: Go to Craigslist. Key http://craigslist.org into your web browser’s address bar to bring up the main Craigslist page. In the search area at the top left of the page, you can select from various categories with which you can narrow your search. The primary category is of course, “Jobs,” although we have found some positions advertised in the “Gigs” category as well. Searching with Lifeline Phone will bring up a small number of ads, as the search is pretty specific. But it will miss some ads that do not have the word Lifeline in it. So, you’ll want to also broaden the search with a search of Free Phone. This will return a very large number of ads — mostly ones that are not what you are looking for. But, you can find buried in the search results ads for companies looking to hire sales reps to enroll people in the free government cell phone program. You are just going to have to scroll through a few pages of these ads, looking at the titles to see if any pop out at you. You’ll know them when you see them–they will have titles such as “Get Paid To Give Away Free Gov. Phones,” “Government Cell Phone Agents Needed,” and “Lifeline Assistance Cell Phones,” to share a few that we’ve seen. You can’t miss them. It’ll take a a few minutes, but you are job hunting after all and that takes some effort. Caution: don’t key in “free phones” as a plural. Use the word “phone” singular. The singular will find ads that have either “phone” or “phones” in the ad. Using the plural will miss ads. Even after all this, it’s possible that an ad might have been missed. If you want to continue, just try various search combination using the words, Lifeline, free, wireless, cell, etc. You’re just going to have to play around with a bit. After you’ve tried those, you can also try keying in the names of the cell phone providers that do business in your state. To find this list of company names, begin by selecting your state by clicking here (https://www.freegovernmentcellphones.net). After clicking on your state you will see a list of the companies in your state. So, you might search for Assurance Wireless, Budget Mobile, Safelink Wireless, Access Wireless, Reachout Wireless, and so on. As we said earlier, some of the ads may not be in the Jobs category. It’s uncommon, but the Gigs and Events categories may contain an ad of interested. So you can use the pull down category selection to switch over to Gigs and then to Events. The search results will be divided into ads found in the specific area you specified, followed by and ads in nearby areas. Those nearby areas may be of interest if you are able to travel to them for work, so be sure to take a look at them. The ads you find will have been created either by the wireless company itself or more likely an agent or distributor for a wireless company. They will provide for any one of several ways to reply to the ad poster. Call: The ad may have a phone number listed for you to call. Email: The ad may show an email address listed in the ad that you to will have to email. Show Up: The ad may ask you to meet someone at a location for an interview. Website: The ad may include a website address that the poster wants you to go to apply. Reply to Ad: Many ads do not list a phone number, email or website address directly in the ad copy. In this case, look for the “Reply” button, usually located at the top left of the page. When you click this it will tell you how to reply to the ad. It may show an email address, phone number or website. If it’s an email, it may be a regular email address or it could be a Craigslist-generated confidential email address. With any method of contact requested by the ad poster, please remember that as with anything on the internet, be very careful and use common sense. There are scammers on the web and you’ll never know when you’ll run into one. Be careful what information you give out and where you might meet someone. You can contact come of the companies directly about how you might be able to work for them in enrolling customers. Not all companies allow this, but we’ve listed below the companies who have a page on their website set up for this. But not everyone we’ve listed might be appropriate for your job hunt — you’ll have to decide when you go to the page and read it. Some, like Budget Mobile, are very clear that you can apply to their Street Team sales force right on their page. But then some of the companies’ pages we’ve listed might only be looking for higher-level agents and distributors; i.e. those with a storefront already. Since we can’t be certain, we’ve listed all the ones that look like there is a chance you might be able to snag a street sales representative position by contacting the company. States: Arkansas, Maryland, Missouri and Oklahoma. States: Colorado, Hawaii, Illinois, Indiana, Kentucky, Maryland, Michigan, Minnesota, Missouri, Nevada, Ohio, Pennsylvania, Rhode Island, Utah, West Virginia and Wisconsin. Note: They are looking for “partners,” you’ll need to check what that means. States: Alabama, Arizona, Arkansas, California, Colorado, Connecticut, Delaware, District of Columbia, Florida, Georgia, Idaho, Indiana, Iowa, Kansas, Kentucky, Louisiana, Maine, Maryland, Massachusetts, Michigan, Minnesota, Mississippi, Missouri, Nevada, New Hampshire, New Jersey, New Mexico, New York, North Carolina, Ohio, Oregon, Pennsylvania, Rhode Island, South Carolina, Tennessee, Texas, Utah, Virginia, Washington, West Virginia and Wisconsin. States: Arkansas, Arizona, California, Colorado, Georgia, Hawaii, Idaho, Indiana, Iowa, Kansas, Kentucky, Louisiana, Maine, Maryland, Massachusetts, Michigan, Minnesota, Missouri, Nevada, North Dakota, Ohio, Oklahoma, Pennsylvania, Puerto Rico, Rhode Island, South Carolina, South Dakota, Washington, Utah, Texas, West Virginia, Washington, West Virginia, Wisconsin and Wyoming. Arizona, Arkansas, California, Colorado, Connecticut, Georgia, Illinois, Indiana, Iowa, Kentucky, Kansas, Louisiana, Maine, Maryland, Michigan, Minnesota, Missouri, Nevada, North Dakota, Ohio, Oklahoma, Pennsylvania, Puerto Rico, Rhode Island, South Carolina, Texas, Utah, Washington, West Virginia and Wisconsin. Arkansas, California, Colorado, Iowa, Kansas, Kentucky, Louisiana, Maine, Maryland, Michigan, Missouri, Nevada, Oklahoma, Pennsylvania, South Carolina, Texas, West Virginia and Wisconsin. Note: They are looking for “dealers,” you’ll need to check what that means. States: Colorado, Georgia, Hawaii, Indiana, Iowa, Kansas, Kentucky, Maryland, Michigan, Minnesota, Missouri, Nebraska, Nevada, North Dakota, Ohio, Rhode Island, South Carolina, Utah, West Virginia, Wisconsin, and Wyoming. States: Arkansas, Maryland and West Virginia. Id like to learn how i can earn money distributing phones. Im located in Upstate NY. I was recently approved for a free phone. The person who signed me up for the free phone, said they made 10$. Is this something that I could do? We have no way to know what your capabilities are nor if any of the companies in your area are hiring, Tavius. In addition, you should know that we have changed our opinion since this article was originally written and now we strongly urge our readers NOT to enroll at street events. So where are you in ” UPSTATE ” NY??? I was born and raised in a suburb of Rochester. My hometown is Webster, N.Y. and I graduated from R.L. Thomas High School and went to M.C.C. and then R.I.T. B4 I entered the USMC. I have a lifeline agent license and would like to open a store in the eufaula ok area. I worked for assist wireless before but did not like the way I was treated by the lifeline team I was sub contracted under. I would like to open my own store. How could I do this. What do you mean when you say that you have a license??? Seriously, Nicholas, doesn’t a superior human being such as you have something better to do than nitpick this website and its readers? Is there any information available on how a foster teen in Nevada may be eligible to obtain a free government cell phone? The teen is only eligible if he/she is over 18, Danielle. When they reach that age, they can enroll like anyone else, but they cannot get a free government cell phone until then. Once again NOT TRUE !!!! No, Nicholas, your remarkable brain power is so stunning that everyone at this website would be far too intimidated to ask for your assistance. To tell you the honest-to-God-truth, Sandra, we don’t even know what’s going on with your comment. It’s a strange one. Yes, all new customers receive smart phones and all smart phones include cameras. I would like to report a phone representative for misconduct in the L.A. area. This is an independent informational website, Karen, so you cannot report any misconduct to us. (Well, you can report it to us, but we cannot do anything about it.) You need to contact the company that the rep was representing. I would like to know is there anything that can stop an ordinary person from being hired for this position? In other words, what are the exact requirements to qualify for a sales rep position? Sorry, Til, but we don’t have any idea what you’re talking about nor whose phone number you want. Hello, do y’all have a work from home online business where you can own your own life line WIRELESS company? Hah! We wish, Angela. Getting approval to become a Lifeline company is an incredibly expensive process that takes millions of dollars and top notch attorneys who know all the ins-and-outs of the cell phone business. I own several nursing homes in the Los Angeles and Las Vegas area. Many of my residents are on Medicaid and need lifeline assistance. Any of them who qualify can enroll, Kurt. However, special paperwork must be filled out because they live in a group home. Ordinarily, only one free government cell phone is permitted per address, but exceptions are made in cases like yours. You may want to contact one of the companies’ customer service teams to discuss. NOT TRUE OMG THERE ARE SOME INCREDIBLY MISINFORMED PEOPLE ON HERE.. OK THEY ARE JUST PLAIN STUPID… SHOW ME WHERE IT STATES ONE PHONE PER ADDRESS. I AM ASTONISHED AT THE LEVEL OF IGNORANCE FROM MY COUNTRYMEN… IM ASHAMED TO CLAIM I AM AN AMERICAN. GO TO CALIFORNIA LIFELINEMCOM AND YOU WILL SEE THE PROGRAM STARTED IN 1985 AND UNTIL 2006 WAS A SUBSIDYFOR THE P.U.C. now do you see why as a former USMC Scout Sniper I am ashamed to admit I am American. When I travel I claim Canadian..
Interestingly enough, Nicholas, we’re ashamed of you. We’ve done a lot of international travel and we’ve never been afraid or ashamed to admit we are American. We’d love to give you a job, Jennifer, but we are not a free government cell phone company. This is an independent informational website. I am looking to open a location (tent) in Oregon. Am I waisting my time with that idea? We strongly urge all our readers NOT to enroll at street events because they have been the scene of so much fraud and abuse. You’re much safer enrolling by phone or online. I am trying to get a job handing out free lifeline cellphones. I have 2 years experience very self motivated. Check the Craigslist “Help Wanted” section in your area, Renee. They often advertise job openings for the free government cell phone companies. Hi I have been trying to reach u all by Customer Service phone (1800 378 1684 for last two Months but the line hang up at the end of the directions. I am visually impaired and needs assistance. Safe link keep sending cards about usage but i never received the phone and your customer service never picks up. I spoke to other in the disable network and a lot of them visually impaired have same problem. We are organizing a write-in campaign to the FCC and the BBB. If u feel honest est to print this Comment and see if u get others who agree! Can a household now have more than 1 Lifeline phone? Meaning, can 2 qualifying residents each have their own phone said December 2017? Thank you for your reply. Sorry, Michelle, but only one free government cell phone is permitted per household. How do I get on your team? Watch Craig’s List for help wanted ads, Ethelette. I have a brick and mortar business. would i still be eligible to distribute this service? Thanks! That’s helpful for shure. Well you need to apply for one of those jobs. We strongly urge our readers NOT to enroll at street events because they have been the scene of so much fraud and abuse. How can it be fraud if it is free? What kind of abuse? Several kinds of abuse, Jim. Fraud by agents who sign up customers who don’t qualify. They get paid for every phone they distribute, so some of them are willing to commit fraud by enrolling people who don’t qualify for the program. There is also tons of fraud by people who have multiple free government cell phone accounts. There are other scams involved, but that’s enough to answer your question. Does the street vendor determine who qualifies for a phone? I thought customers were screened by the app the vendor is using. How can it be his/her fault if someone is cheating the system? How is it different if they apply at a brick and mortar type of business? The street vendors are generally paid a commission for each phone they distribute, so they are incentivized to give phones to people who are not qualified to receive them. There are countless incidents of fraud in this program and we have constantly editorialized against it. The companies have been fined repeatedly for fraud and abuse that they have been willing to overlook. In fact, one company’s fraud was so extensive that they were fined out of existence. Very few of the free government cell phone companies have brick and mortar stores. Nothing in this world is free. How does a company like assurance profit from giving out free phones to qualified individuals? You can find that info in a number of articles on this website, Jay, but we’ll be good guys and recap: Every phone bill in the UNited States includes a line item called “Universal Service Fund.” It’s generally a few cents per month per phone bill. Each free government cell phone company is paid $9.25 per month per customer out of those funds. How do I become a distributor? Not one of the team members but the person hiring? Tough to answer that question, April. To begin with, most of the free government cell phone companies sub this kind of work out to other companies. (That’s one of the reasons there have been so many problems with fraud and abuse of the program at the street tents.) In other words, you want to become one of those subcontractors. We would suggest that you reach out to the corporate offices of the various Lifeline companies in your state. I need a job giving out phones on the streets of Spokane can anyone help me please? Check the help wanted ads on Craig’s List, Tracey. Good for you, Gary. Way to go! Can you send me the information to get started please. The volume of comments and questions we get every day make it impossible for us to do as you ask, Jessica. But we often suggest that people in your situation check the Help Wanted ads on your local Craig’s List. Many of the free government cell phone companies use that website to find employees. You can’t believe how many readers ask us how to reach a live rep at Access. As far as we know, it’s impossible. We’ve tried repeatedly and we’d like to think we’re reasonably intelligent people, but we have had zero success. In other words, we do not know how to reach Access. Are there any readers out there who’ve had success? Keep in mind, though, that new rules went into effect late last year. They state that your account will be cancelled if your phone goes unused for 30 days or more. So your account may have been terminated. Contact Safelink corporate headquarters, Sandra. Only Safelink can answer that question, Jenny. Look up the company on our “Providers” page. We provide contact info. What is wrong with you people? The poor guy/girl has told you at least 20 times that he ISN’T a service provider but rather an independent website with information on it. Actually read the comments before commenting. If you would have done so you wouldn’t be asking the same things over and over and over again. Nothing else we can add to this one. Thanks, Elliott. Read the article above and do as it says, Stacey. Well this question may be farther from our area of expertise than any other one we’ve ever been asked. But what the heck, we’ll give it a try, Cynthia. If you file as an individual you probably don’t have an EIN. You probably file using your social security number. But we are NOT CPAs, so please check with one. Sorry I have a few things to say and don’t want to leave just one big paragraph also if you are here to complain about the people handing out the phones please take in to consideration that they are probably haveing a hard day and its not them approveing you for a phone its the company we only sign you up they do the rest so if it takes forever to get your phone don’t blame us its them were just doing are job if you want to complain call the company we work for for being slow don’t complain to us please thanks for your time and remember its a free phone so why complain at all ? Here is a few things to consider before working with a free phone company can you handle people getting made at you if they aren’t excepted for a phone ? I’ve been spit on called names yelled at even had people go as far as trying to fight me not all places you set up are going to have respectful people Ive only been working four days and I’m already overwhelmed by how much disrespect people give me I strongly wouldn’t recamend working here if you can’t handle people given you some bs. ive been doing it for about 2 months. dont let it get to you, I get it all the time. its customer service, so you encounter all kinds of people. People are your territory to work with, and sometimes they even come to your table and you just do the work on your tablet. Ive been doing it for awhile and loving it so far. The only place we know the jobs have been advertised is on Craig’s List, Jessica. Check there. I would like to know more about how I can help people in my community. If you’re referring to handing out phones, Lisa, you’ll need to contact each of the free government cell phone conpanies in your state to ask them. I would love to earn cash and help people. I would like to know how I can apply for a career at your company? I live in Anniston, AL and have 20 years experience in Sales. Hello, can someone please contact me. We manage true wireless and would like to advertise or get updated information to your site. Two things: (1) We are unfamiliar with AndConnectUs, so we assume it must be a local office of some sort. (2) If you have been recertified, your service provider will surely be able to help you. Give them a call. We think you’ve left this comment on the wrong website, Christy. It’s nice that your sister told you that we were a “better provider,” but we are an independent website, not a free government cell phone company. In other words, you need to speak to customer service or go to your service provider’s website to use the “Check My Status” function. I just applied for the free government phone. I have one from q link but the screen on the smart phone is cracked and I cant afford the twenty five dollars for a replacement phone so I was trying to get another, I’m not trying to defraud the government just trying to get another phone…could u please help. I can call on it but I cant see to text. thank you for your time and consideration in this matter. We’re an independent website, Richard, not a free government cell phone company. But we can tell you that you won’t be defrauding anyone as long as you inform your new service provider that you already have an account with another company. They will tell you what steps you need to take to stay on the right side of the law. How do I get a job giving phones? Those people are usually employed by subcontractors hired by the free government cell phone companies. We can’t tell you who those companies are nor where they are located. The only “help wanted” ads we’ve seen were on Craig’s List. Give it a try. I get online leads for these services every day. Is there anything I can do other than make a MFA blog/website? Are there any affiliate programs or companies buying leads or anything like that? I mean, every day I get a message on my Facebook or elsewhere from someone asking how they can get a free phone. I don’t want to set up a booth or get a job. I have a business. Since it’s not part of my business I just direct people to the official utilities commissions in their states, but I admit it would be nice to get a few bucks. It would, indeed, be nice to get a few bucks, Bob. But take it from us, there are no affiliate programs that actually work. Lord knows, no one would love that more than us. So feel free to direct those people to this website, where they can get all the information they need. This is not a forum to discuss the inner workings of FreeGovernmentCellPhones.net, Alex. Sounds pretty fishy to us, Tammy. What company is supposedly sending you 100 cell phones? Sorry, Nichole, but we deleted your contact info because we have no idea who you are nor if you are legitimate. We have to protect our readers. Yes please contact me. I would like a job signing people up with your company . I’ve worked for assurance wireless for the last 2 yrs. We set up a tent…do online ads on social media. We dont chase anyone down unlike a few unnamed companies i see. Poor guys chasing ppl all over and i’m sitting in the shade with a 20+ person line before me. It also helps we give out actual smartphones instead of those outdated calls only phones. Also yes you can make approx 1k a week. Closest i’ve gotten was 800 a week. It was great. Now i average between 500 and 800 a week….if it’s really nasty outside i’ll do considerably worse. Learn your audiences habits and where they’ll be. Perfect example, talk to an office manager of an access office.. see if you can set shop outside…everyone going there either has benefits or is applying. Easy money. Hi, how do I apply. I would like to earn cash. In most cases, Tamesha, the free government cell phone companies do not hire the reps. They hire outside companies and it is those companies who hire the field reps. The only place we have seen these jobs advertised is on Craig’s List. Give it a try. How do I find out where your agents are??? We don’t have agents, Shannon, because we’re not a free government cell phone company. We’re an independent website. Contact your service provider’s customer service team. How can I apply for assurance wireless? Each company listing has all the contact info you need. Contact customer service or apply online. Lol bless you answering the same question over and over and over and…. …and over and over and over and over and over and over and over and over and over and over and over and over and over and over and over and over and over and over and over and over and over and over again, Nick. Thanks for noticing. Sounds like this is something I’d be interested in doing as well. Any suggestions on how to apply to Assurance Wireless to become a sales rep in my area? Not really, Elena. Most free government cell phone companies subcontract their street tent efforts out to another company. It is that company that hires the reps. The only sources we’ve seen for these jobs are ads on Craig’s List. Give it a try. As hard as we’ve tried to get an answer to that question, Buffy, we’ve never been able to get a good answer. We’ve even spoken to Lifeline company executives who don’t have a good answer. Can we ask a favor of you, Buffy? How about if you call the Montana Public Service Commission and ask. Please let us know what they say. hi can I apply online? Do as the article says, Vicky. Good luck. We hope you can land one of the jobs. There’s no regulation that says you must have a social security number. Admittedly, it’s unusual for someone not to have one, but we don’t think it’s an insurmountable problem. Your clients would qualify based on the programs in which they participate. Actually the last 4 of a social security are needed. The persons id or licence is verified in 2 ways. By the id or dl number being run through the dmv and the last 4 being ran through social sec. If everything comes back fine they can proceed. If something isnt right you are informed to fix the issue before being allowed to proceed. Ive been working as an ind contra for 2 yrs with the free cellphones. ATTN: All you people wanting a job handing out ” free Obama phones”. Just keep it in mind you may want to work for a company that sets you up in an office or tent, where if people were interested in coming to see you. I do not like phone solicitors, (or any other type) knocking on my door. A large man just came to my door and gave his pitch about the free phone. He was nice, had a bag full of phones, and wore an I.d. badge around his neck. But he looked, ( not saying he was) casing my house. I will say it would have ended very badly in his favor if he made any false move that was in a threatening manner. Most people in the safety and comfort of their homes WILL do what’s necessary to protect property and most important family. I do not trust strangers, ( especially coming to my front door uninvited) . So if you want or need a job handing out phones, great, but be aware you are a stranger. Use common sense, and most important, if there’s a sign posted at a house or apt. building that states ” No Soliciting “, THAT MEANS YOU!!! Excellent advice, Dennis, and a very interesting story. As you’ve probably seen, we do discourage our readers from applying for free government cell phones at street tents and booths. Im just curious how you ended up at this site and was it just to specifically comment post the solicitor at the door? It would seem strange to go door to door at actual houses to see if people want to sign up for a free phone, perhaps the “solicitor” at your door was only really casing in order to figure out if going door to door is even reasonable being that most people whose incomes are too high to qualify for the sponsored phone dealio would make for a long day of being told no over and over. Just sayin. Could have appeared to be casing , but not necessarily in hopes of coming back to rob the place. Only certain lifeline providers are background check and drug tested regularly. Educate yourself in what the qualifications of a company has the employee process or speak with an agent and/or management. You sound like a typical paranoid person, that’s just f*cking sad.If you shot someone who was just offering you a free phone, you’d go to jail. That person wasn’t trying to rob you, he could also sue you if he survived. I know I would if somebody pulled a gun on me because they are scared. I mean do you go pulling out firearms on Jehova witnesses? You probably would. And they hit on my door all the time. These people are jut trying to do a job any way they can to make money. There is no need to be getting all paranoid and sh*t.
Or it could end bad in your favor if that person knows how to fight and you threaten them. You’d also have to explain yourself for injuring or threatening them when all they were doing was offering you a phone. I lived in some very bad areas most of my life right here in NEW YORK and I’ve never been terrified of strangers hitting on my door even during the 90s when everybody was messed up on drugs everywhere, neither was my grandmother. I mean are you that scared when you go out or do you stay locked up in your house like a hermit because you think everybody is out to get you? Kind of terrible to live that sort of life. That’s fabulous, Roosevelt, whatever it means. TO WHOM IT MAY CONCERN I HAVE A ACCESS PHONE THAT DOE’S NOT WORK. I CAN CALL OUT AND PEOPLE CAN CALL IN. I CAN HEAR THEM BUT THEY CAN’T HEAR ME. I CAN NOT GET IN TOUCH WITH ANYONE. THIS IS MY ONLY WAY OF CONTACT. PLEASE I NEED YOUR HELP. You’ve run into a very common problem, Nora. It’s virtually impossible to reach a live person at Access. You can send an email via the company’s website. Most of the Lifeline companies hire other companies to handle the street booths and tents. You’ll need to contact corporate HQ to ask who they hire in your area. Try asking for Human Resources. Hello, I’m a newly appointed state director for Safelink, and am looking to build a large task force. If you are interested in getting started today please submit your resume to ****@gmail.com. Leave a phone number in email as a member of our team will conduct a short phone interview. I look forward to speaking with you, and giving out this great opportunity to whomever wishes to pursue it! Thank you, and have a great day! You may or may not be the state director for Safelink, as I Googled your email address and I’ve seen it used on other recruiting contexts. If you have a SafelinkWireless.com email address you can publish it in these comments. The people who work at the tents and booths are independent contractors who usually work for independent contractors hired by the Lifeline Assistance companies. You’ll need to reach out to each of the Lifeline companies individually to find out which companies they hire to work at the tents and booths. Hello, i recently applied for a position. How far back legally are your companies legally allowed to go back as it relates to background checks? Are these second chance organizations? We’re not one of those employers, Tina. We’re an independent website that is not affiliated with any of the free government cell phone companies. So we have no idea what their background check policies are. Nevertheless, we wish you the best of luck in your job search. Background check goers as far back as 18. Shows your whole criminal record. Arrests, misdemeanors, felony’s, and even cases that where “throw out”. I was wondering on how I would go about finding info on the independent company I worked for handing out phones. I started first in Syracuse NY then did some out of state jobs. Now Im trying to get my check from working and Im being told no. How do I find out who owns this company through Safelink? This is a new one for us. We’ve heard a thousand complaints about the indepedent service reps committing fraud and abuse on customers, so we suppose it’s not surprising that they’d do the same to their employees. Explain your story to whoever answers and ask them who you should talk to. We’d love to hear more about this case, Ericka, so please keep us updated on your progress. Geezz, Call the Labor Board, call State Dept of Employment. Why are they telling you No? SafeLink is run by a subsidiary of América Móvil, the world’s fourth largest wireless company in terms of subscribers, but it is not paid for directly by the company. Nor is it paid for with “tax payer money,”. Hell i am Patricia Robinson. I would like to hand out free cell phone. I really need a job. I’m hard working and always on time. Most of the free government cell phones do not employee the people who work at the street tents and booths. Instead they contract with an outside company that employs those people. That means that you need to contact the Lifeline companies in your state and ask how to get in touch with the companies they contract with. Because those are the companies you want to apply to. How do i get intouch with Access Wireless about working for them in Kentucky. Damn good question, Alicia. Our readers tell us it’s virtually impossible to reach a human at Access. The only way to contact them is by using the website’s email form. You’ll need to speak to each of the service providers, Cindy. In most cases, the Lifeline companies hire outside sales organizations and they are the ones who hire the outdoor reps. I worked for budget, when they changed the policy I emailed them and they never responded. I have a small business in Westminster city, CA 92683. I want to become a agent for providing free phone (government assistance) to the low income. Can you let me know about the procedures to be that kind of agent. I want to become an agent for Budget Mobile but no one will call me back! Is there a way to contact them directly for a job?? We are not privy to the inner workings of the deals cut by individual Lifeline Assistance companies and the independent contractors who take applications and hand out phones. Many rep organizations leave comments and attempt to recruit employees here at FreeGovernmentCellPhones.net, but we never approve those comments because we are unable to vouch for the credibility of those reps and organizations. If one of those reps or organizations would like to answer Andrews question, we will approve the comment. How can i bild my own copany up i am willing drive and helping people in need is good i was working in a plsce homless so i. Really no how connect. With people; pluse i no were go as well pless let me no ok please . Building a business is a lot tougher than it sounds, Floyd. We’re recommend a few basic business courses at your nearest community college to get the background you need. What about safelink wireless where do I sighn up for that? Click on the “Providers” link at the top of this page. Then across down and click on the Safelink listing. You’ll be taken to a page that tells you all about Safelink’s program and lists their contact info. That undoubtedly differs with each company. You must contact individual companies offering service in your state to ask about their systems. You can find a complete list of companies by clicking on the “States” link at the top of this page. Then click on your state’s name and all the companies will be listed. We suggest clicking through all of the to see which company seems like the most likely to hire you. Virtually none of the free government cell phone companies publish their booth schedules. There’s a good reason for that — most of their street sales teams are independent agents who set their own schedules. On top of that, we do not recommend signing up for the program at street booths. We’ve received too many complaints of fraud. Instead, we recommend signing up online or by phone directly with the companies. You can find a complete list of free government cell phone companies by clicking on the “States” link at the top of this page. Then scroll down and click on Indiana. Click through all the companies to find the plan that’s best for you. Unfortunately, Tony, you cannot work directly with the government. You will need to discuss your business concept with individual free government cell phone companies in your state. Find them by clicking on the “States” link at the top of this page. Then scroll down and click on your state’s name to find a list of all free government cell phone companies in your state. If we were you we would click through each of those companies to help you decide which ones you want to approach first. Good luck with your business idea. Please let us know what kind of progress you make. Some free government cell phone company websites actively seek employees, but we’ve never found any “Come work for us” or “Job Openings” listed on the Safelink site. But that doesn’t mean they’re not looking, Kayla. We’d suggest contacting the company either by phone or online. You can find all the contact info on our Safelink page, which you can access by clicking on the “Providers” link at the top of this page. Check each company’s website and contact whoever is in charge of hiring in your area. We wish you the best of luck, Amanda, but we are not one of the free government cell phone companies, so we cannot hire you. Contact the companies directly if you are looking for work. I NEEDS A JOBS CAN YOU HELP ME OUT PLEASE. Contact the free government cell phone companies and apply. I think you have a lot of good info but really you need a grid or something to display your answers about each company. Hard to follow the comparisons. I am in Cal. I have a Budget ..it is so bad that now it is broken after one month of use I would like to see what else I could have done. I can’t follow your answers at all . I am on this post by accident… before you marginalize me and my comment because I am poor and need a phone ( you know you are) I would like to say I see your sincerity and hard work and I am just suggesting you could make it even better. HOW CAN I BECOME A VENDOR IN PUERTO RICO? You must contact each of the free government cell phone companies doing business in PR to see if they are hiring. You can find that list by clicking on the “States” link at the top of this page, then scrolling down and clicking on Puerto Rico. Good luck. How do I obtain phones so I can become a vendor or start my own wireless company activating these free phones without actually working under the listed dealers? Each service provider has different methods of distribution. Unfortunately, that means you will need to contact each of the service providers in your state to find out if they offer positions in your area. You can find the service providers in your state by clicking on the “States” link at the top of this page. You must contact the companies directly, Marcia. Looking for a job! Please email me back thank you. You must contact the free government cell phone companies in your state to find out about job openings. We are just an informational website. No wonder. We are a delightful group of people. But we think you meant you want to work for one of the free government cell phone companies. In that case, find our list of companies in your state by clicking on the “States” link at the top of this page. Then click on your state. You will have to contact each of the companies directly to determine who is hiring. Good luck. Thank You very much. I began this journey looking for free gov. phones for my mother and my uncle, which is deaf, to be able to communicate with each other while shopping and such. I showed them how to put the phones on vibrate and have phrases programed on them. This site is amazing ! Also, I am disabled, looking to make extra money. You guys really opened my eyes as this seems to be something that I can really get behind ! Trying to find out how to get a job in bronx ny handing out free government phones , I’ve tried and tried to no avail please help if you can . i worked for tempo here in columbus ga last year. how do i get my 1099 r? I would just like to say , thanks for such investigated work, and bringing it all here for those seeking the phone distributions. I had sought to find a position all last summer in vain. So your leads are much needed and helpful.. It appears to be simple , and straight cut, service work to do. I am interested in something in my area of Gary Indiana. I have seen several tents set up as well as different agents knocking on my door to sign me up for a free phone. I have door to door canvassing experience, and quit alot of customer service skills. I believe I myself has what it takes to be a local agent due to the size of my city and knowing almost everyone! Regina – in what city do you live in? If anyone is hiring immediately for my state; please contact me.. But many companies that work in Florida get audited. I am looking to work for a company in Florida because I am moving there soon! Which companies work in Fl? I am/ have been a cell phone distributor for about 6 months now. I personally love the job! There are many negative people tho and you have to be “kind” to everyone. If you have worked in fast food, you can’t for sure handle this! I am very interested in becoming a free phone distributor in Fresno, Ca. could you please let me know what the process is? I am interested in employment with your company as a cell phone distribution agent in the Fort Washington and Beltsville Maryland areas. I would set up a tent in those two areas and distribute your cell phones. I heard about this job opportunity while trying to find a company that would issue me a cell phone, so that I could seek employment in Maryland. I just became unemployed four weeks ago, due to seasonal changes. While employed on my last job, I was a pool operator on outdoor pools. Now, there isn’t a need for my professional services, so I must seek another type of employment. I am a dedicated individual, and my last job, before the one I wrote about above, I was a Manager at a Sports Complex indoor pool for the Maryland National Park and Planning Commission. I was there for over fifteen years or more. I am not with any government program right now. If it counts, my daughter, age three, is with the Maryland Medicaid program under the Maryland Health Connection.gov. If you could issue me a government issued cell phone, and information on how to become a cell phone distributor in Maryland, please contact me or write to me at ************************** Maryland 20744. How do i become a free phone represenative in san jose ca? I am trying to build a sales force to sign up people for free government phones. Since our church works with people in recovery from drugs, abuse, alcohol and trauma, we have a ready made base for a free phone and other services. The first company I contacted didn’t work in the state of Idaho. I would be willing to start from scratch if necessary with Lifeline or anyone else. Please let me know where to go with this. Hope you will accept me into your family.looking to work hard 24/7 365 days a year to make your company better and for me to be apart of it…..thank you. I would love being a free phone distributor, I really enjoy helping people and I feel that it would be so amazing seeing smiles on dozens of faces. Thank you so much and I look forward to hearing from the hiring professional for more information. Greetings please send me info about the snap eligible internet services & phone please thank you and have a Happy Holiday! I’m trying to get a hold of someone thru assurance wireless who hires people to give away phones I’m in woodland ca. One of there employees has my drivers license my bet card and my medical card. Nobody will help me find him.it was last Saturday after noon he is hired with assurance they won’t help me find him.My name is Tanya baker/whitbey I just need my d.license .my number is please give it back to me. I am enquiring on how to become a distributor for the free phone government program. What steps are needed to set up a tent in Albuquerque NM? To supply low income families with the opportunity to have communication for work,Dr. Appointments ect. I have signed up with Bluejay Wireless in Arizona and have been told that I can use my SIM card in an iPhone. But my phone budget only allows for a refurbished, unlocked iPhone 4S which I think only works with HDMA networks. If I buy this iPhone will I really be able to call, text and use data on it? I applied for a position with a repersentitive in Tucson Az. He said he was a manager . All I got was his name was Ed. I filled out a application and he took my picture for a badge said he would call the next day and that has been a week ago.can you help me find out what happend to my application from manager Ed ? I would like to work for Life Wireless handing out free cell phones in Southern California. I speak English and Spanish. TruConnectDirect is not listed, currently in California and Texas with more states coming soon, visit texas.truconnectdirect.com to become an Independent Agent. I WOULD LIKE TO LEARN TO MAKE MONEY WITH THIS COMPANY. I live in Vallejo, California and would like a job distributing free cellphone service to those that qualify in my area. I enjoy working and helping people from all walks of life. Can you tell where, what, and who I need to contact to the job working in Vallejo, California? A SPRINT/TRUE WIRELESS representative signed me up for a free phone on September 17, 2015 at a State Government Office, because I qualify, but I have NOT received the letter he said I would receive first, nor the phone (2-3 weeks) after giving this guy the application with my personal information on it. I am upset and feel that that was a scam or either True Wireless AND Sprint collectively dropped the ball on processing something which has been funded by the federal government. I want to know who do I contact regarding this matter before I end up reporting it to the federal government concerning possible fraudulent practices. Hello my name is Tracy Garmenta. I live in Fresno Ca,93705 I am a mother if 12 children who are now grown. I am very familiar with the financial struggles that low income families endure and want to help lesson that burden. I guessed my puk code wrong ten times not knowing I had to call and get a lock pin code from the provider. now my sim cards blocked can you please email me back on how to recover my phone plan asap? I am looking for a company to distribute phones out in Mississippi. Does anyone know of a company other than Assurance? I’d like to sign people up to make money. How will I get paid for this? and disabled so I know I would be an asset to any company. I live in between north and south Carolina. I would love to help people get free phones and to work with your company. Please tell me how. What state is in between North Carolina and South Carolina? Just want to give out cell phone in my neighood and make money. Okay. Good luck to you. I’d like to know if i can get a free phone the same day i sign up. If you go to a location that has the phones on hand you can. But if you call or order online expect to wait up to several weeks. Honest folks, I’m not the kind who thinks things are stacked against me. I’m an 82 year young Korean war vet who’s survived to have a wonderful life, then and now. BUT – I noticed how not a single potential source included possibly the most populous state of oldies, retired or needy seniors as Florida. Could it be that they’ve determined that we are too old or incompetent ? Thanks for the huge undertaking in bringing the whole cell phone issue to us. Airman First Class, U.S. .Air Force 1951/1955. Fine Artist !959 to present. If you want to sell for the largest lifeline provider in the country you have to go through one of their master program enablers. Email: danny@steetlinkmobile.com to get details. I would like an opportunity to sell government cell phones in huntsville,al. I would like to learn more information. States : Arkansas, California, Colorado, Kansas, Kentucky, Louisiana, Maryland, Maine, Michigan, Minnesota, Missouri, Nevada, Oklahoma, Pennsylvania, South Carolina, Texas, Wisconsin and West Virginia. Thank you very much for the update, John. We’ve added the info. I need a replacement phone. I look forward to working for such a great cause. This entire website is devoted to explaining the program. Start at the home page. I was curious as to if http://www.freegovernementcellphones.net was currently hiring or if the company might be hiring sometime in the near future? No, we’re sorry, we are not.